My love affair with Manchester United started way back in 2007 or so when I had just started watching the sport for real. Man Utd won the league that season, with the likes of Cristiano Ronaldo, Wayne Rooney, Ryan Giggs, Paul Scholes, Rio Ferdinand and Edwin van der Sar running rampant and picking up two league titles in a row, followed by an unforgettable Champions League victory against Chelsea in Moscow. Manchester United was the reigning club. Who didn't hear about their victories? But it wasn't just the trophies that make Manchester United what they are in my eyes. There are many factors that make the club special to me. I remember the first Man Utd match I watched. 2008, right? Oh! what a day. Although I was not an ardent Man Utd fan back then, but the final made me fall in love with the club. It was astonishing to see Ronaldo cry after missing a penalty. Aww! The way they played . . . they really touched my heart. (My colleague, Joshua would say little things can make me fall in love. I know right, lol). But seriously, when despite all odds, you get what you were playing for . . . Manchester has proven it to me over the years. That ability to come back strong from the worst possible situations, both on and off the pitch blows my mind. There are many reasons for people to love Manchester United, Some are born there, some have their favourite player playing for that very club. But for me, who didn't even know what exactly football was . . I fell in love because I found the passion of football in those last minutes . . . I caught the spirit, if I must put it that way. It made me want to see MAN Utd succeed even more. That attack, that goal, that run, that dribble were the common words when you watch Man United play. I cry when they cry. I laugh when they laugh. And I make jest of them when I want to. We can say the 6th position is for Man Utd! Year in year out, I've always supported Manchester United. I enjoy watching Manchester United play. The atmosphere during a game is truly unique and on an important occasion such as a European fixture, it is truly a sight to behold. They make me want to stay glued on football all day. When they score a goal, my heart beats faster. I can feel what they feel a thousand miles away. When they concede, my heart breaks. I am a fan. And I love RED! The most important thing for which I hope is for Manchester United to win. Win every ball . . . every tackle . . . every dribble . . . every shot . . . every game . . . every league . . . every cup! I think it is the thing that connects every football fan around the world. To see their club win. 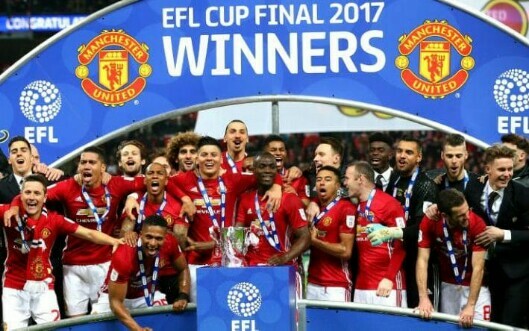 And so Manchester United won the EFL Cup 2017. Yay! When Zlatan Ibrahimovic scores his second goal to make it 3-2 to Manchester United against Southampton at Wembley. Winning is always special. The day I don’t get emotional when we win, I'd know I have stopped being a fan. Oh, Manchester United, I love you! Glory! P.s I didn't think today's Dear Diary was worth sharing until we talked about representing our football clubs at my local church. *whispers* The youths are planning a programme tagged "Jersey Sunday". If you can't attend, watch out for Sunday's post or the one after. It will be massive! What about you; Are you a fan of football? Any special memory? What team do you "pretend" to love and support? Lol.